Iran’s Foreign Minister Javad Zarif said during an interview on Friday with CNN’s Christiane Amanpour that Iran was ready to convert all its existing and future enriched uranium into oxide and fuel for its power reactor so the country could never develop nuclear weapons. Based on Zarif’s proposal, Iran will not reduce its enrichment capacity, and could theoritically increase it, but instead will convert all uranium enriched in the process into a form unsuitable for nuclear weapons. Zarif’s new approach is apparently in response to Supreme Leader Khamenei’s recent instructions that Iran must boost its enrichment capacity, and not reduce it as demanded by P5+1. 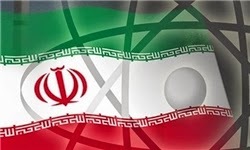 The P5+1 and Iran yesterday decided to extend their talks for four months after it became apparent that they could not close the gap on the issue of enrichment capacity before the 20 July deadline. If by what Zarif is referring to as an "international mechanism" he means foreign participation in the production of nuclear fuel on Iranian soil, this was actually advanced as a solution during the Ahmadinejad administration and summarily rejected by the West. His reference was to a tight international inspection regime to confirm the immediate conversion of enriched uranium into oxide/reactor fuel unusable for nuclear weapons. So Ahmadinejad ideas were better for the West, where the main 'author of this blog' with his proxies, have demonized him at every opportunity. where's the explanation of why Iran needs to increase production of enriched uranium if all of it is to be converted to reactor fuel? what can iran possibly do with more and more reactor fuel when Iran has but the one reactor and no others under construction? it takes close to 20 years to a reactor to be built and go into operation. Akhoond regime want to have a nuclear weapon...they got the idea to get one right after the war with Iraq. For instance... those missile silos were built in the 1990s with nuclear weapons in mind. There can't be any explanation that is acceptable to world powers. How do explain that you intend to whisk away surplus enriched uranium?